Virgin Trains, which operates trains on the UK’s West Coast mainline connecting the cities of London, Birmingham, Manchester, Liverpool, Glasgow and Edinburgh. Virgin Trains had a vision to reimagine the onboard passenger experience, providing passengers with easily-accessible, high-quality content. GoMedia was invited to craft and deliver a revolutionary passenger entertainment system. 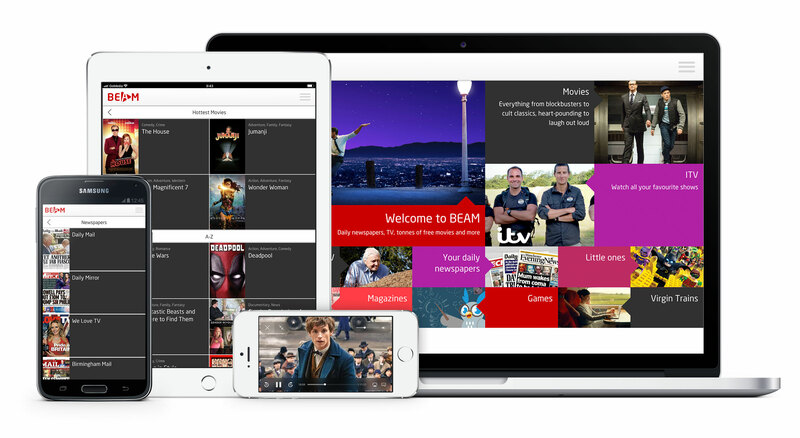 The result was BEAM, the first app of its kind in the UK, which delivers world-class entertainment straight to Virgin Train’s passengers’ own devices – whether mobile or tablet. Content from a server hosted on the train is sent via Virgin Train’s on-board Wi-Fi. Using our unrivalled digital rights management system, we partnered with Virgin's content service provider, DMD, to deliver a customised entertainment package featuring blockbuster Hollywood films, including Independence Day, which formed the foundation of Virgin Trains’ BEAM launch at Euston Station, London. While BEAM significantly enhances the passenger experience, it also serves to free up off-train connectivity for lower bandwidth data users, so passengers who want to check their emails or browse social media will find it much more efficient. At the 2017 Business Travel Awards BEAM won the Best Travel Technology Product award.